Mangaluru, June 6, 2015: As per a news release, Konkan Railway has taken to large scale energy conservation and environment preservation in its day to day operations, Konkan Railway has converted all light fittings in its 90 plus tunnels to LEDs, reducing carbon foot-print. Plantations in a big way on an annual basis along its entire route which has given it the unique identification of "Garden Railway." Konkan Railway said LEDs installed in all tunnels are 24 watt which consume one-third energy consumed by 70 watt HPSV bulbs but gives double the illumination. It has not only conserved energy considerably but also increased safety levels inside tunnels, given the fact that 84 km of Konkan Railway route stretch is made up of tunnels. Konkan Railway has also provided Energy Saver equipment in all its tunnels which controls current voltage so that the electricity drawn is less. Also basic initiatives like phasing out of all incandescent bulbs from railway premises and replacing with more energy efficient T5 fittings, change of all Resistance-type fan regulators used in KR to electronic ones etc, are reaping good benefits to KRCL as well as to the environment. Konkan Railway has also switched over to green energy with installation of solar plants at Ratnagiri and Karmali stations, installing solar geysers at all its running rooms and rest houses. At least 53,699 saplings of various types of plants were planted in last one year by Konkan Railway along its route, 28,000 are to be planted during this monsoon. The Konkan Railway has taken to planting an average of 30,000 saplings per year on its route which is giving a Green Railway look to KR which general public appreciates. A specific type of Vetiveri grass was also planted on the route to conserve the soil. 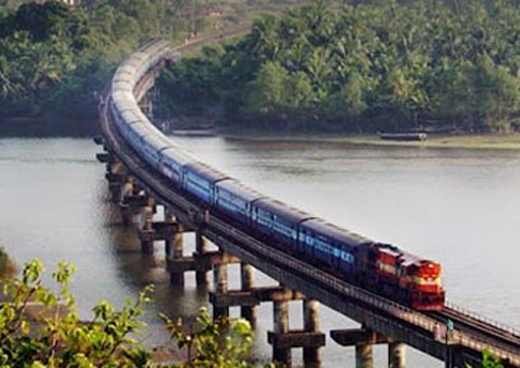 Konkan Railway’s Roll-on Roll-off service, which carries loaded goods trucks on railway wagons thus saving precious fossil fuel, has proved to be a successful innovation. Many new concepts are being introduced.